Like a boa snake strangling a tree, scores of people formed a long line encircling the head office of South Korea's national postal service in central Seoul to buy souvenirs marking the 100th day of the inauguration of President Moon Jae-in. 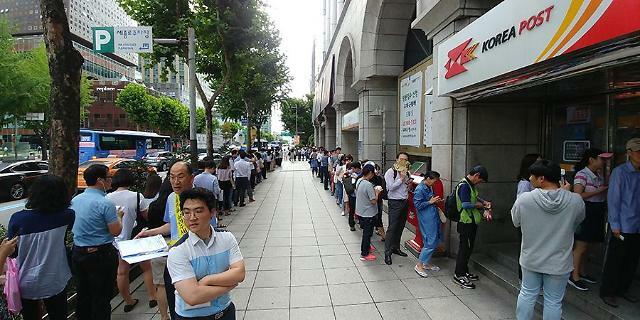 Similar scenes were reported in other cities on Thursday when Korea Post started selling five million commemorative stamps, 500,000 souvenir sheets and 32,000 stamp albums. 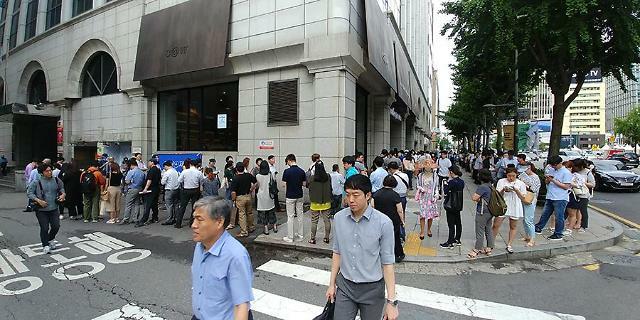 "I've been working at this office for about six years, but I've never seen this kind of a scene before," a postal serviceman told Aju News, showing his astonishment at a long queue around his head office in central Seoul. The number of people with waiting tickets stood at 176, five minutes before the post office opened its gate at the start of business at 9:00 am (0000 GMT). Some people said they had to keep their position for several hours. It's the first time people have formed such a long line to buy stamps celebrating the inauguration of a national leader. 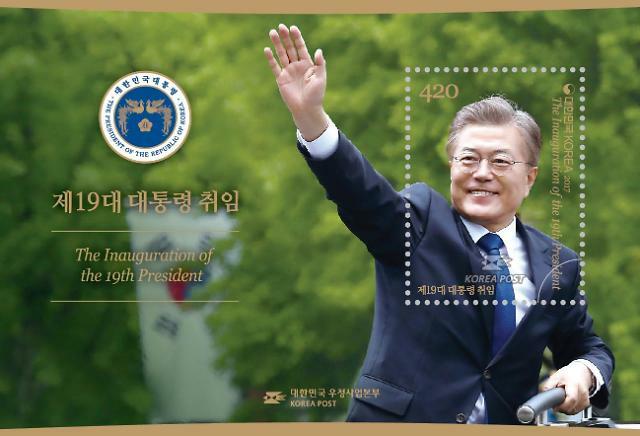 The commemorative stamp priced at 330 won (29 cents), showed Moon wearing a warm smile against the backdrop of a national flag. 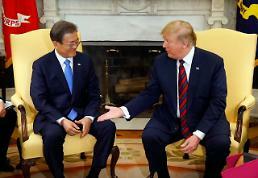 The souvenir sheet priced at 420 won showed him wearing a blue necktie and upholding his right hand, along with a presidential emblem of phoenixes and phrases written in English and Korean: "The Inauguration of the 19th President". 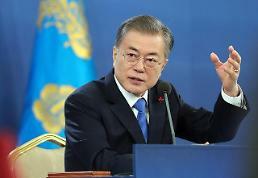 The stamp album priced at 23,000 won contained a large one showing Moon and his wife waving together in front of a large national flag, surrounded by 14 small ones retracing the course of his life from his school days. Initially, some 20,000 albums were to be released through Korea Post's regional headquarters and websites, but the postal service decided to issue more because their explosive popularity led to the suspension of pre-orders on the first day of online sales on August 9. 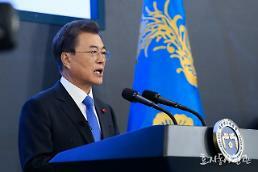 A former human rights lawyer and pro-democracy activist, Moon, 64, took office on May 10 to succeed jailed ex-president Park Geun-hye who was ousted for her role in a corruption scandal. His approval rating has been high always above 70 percent. Moon's popularity was clearly reflected in the queue outside the post office where young people in their 20s and the middle-aged were the majority. 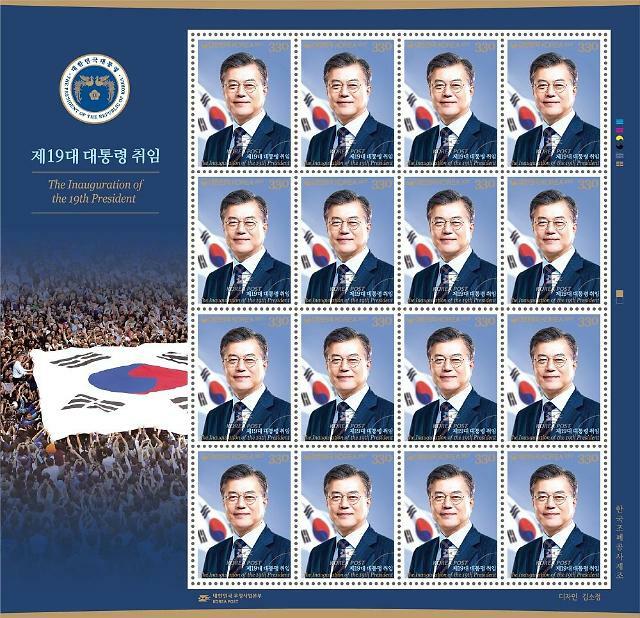 "I think people's aspiration and hopes are reflected in their demand for stamps," said Choi Hyun-soo, a 36-year-old businessman in Seoul. "I joined this line when I saw it from my office. I thought it would be nice to get a stamp set because I support the president." A group of salarymen mischievously smirked alongside Choi. "Our boss will not have a clue of where we are now," said one man. There also were a dozen grey-haired elderlies with anticipation expressed on their faces. "For the last four decades, I've come here to buy every president's commemorative stamps. 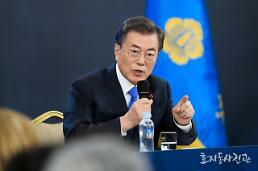 However, I've never been so excited," said Kim Seok-jong, 71. "I am supposed to be here with my grandchild but I left home very early without him because of worries that the stamps might get sold out." Park Hee-bong, a 71-year-old businessman, made a pre-dawn trip from his home in the western satellite city of Gimpo. "This is the first time I've been up so early to buy stamp sets as memorial tokens for my employees," he said. "I think the president is a good role model for everyone and a man of his words. I love him, my employees love him."